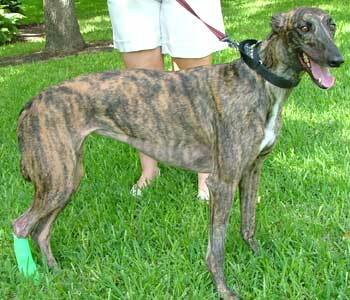 Ribbon, aka AA's Fancy Free, is a beautiful brindle 2-year-old female born May 10, 2002. Ribbons sire is Wigwam Wag and her dam is A Moment in Time. 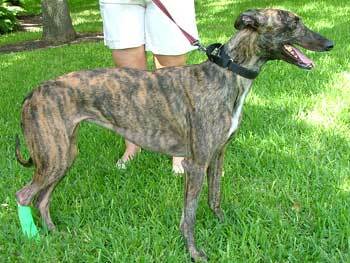 Ribbon raced at Valley Greyhound Park in Harlingen from December 28, 2003 to March 5, 2004 when she suffered a crushed foot. Her foot is healing slowly, and on June 9, the screws and plates were taken out and an artificial bone graft was inserted. She is responding very well at this time. Due to the severity of the injury, Ribbons foot is badly infected, so she is taking very expensive antibiotics. Ribbon is recuperating in a foster home in Austin, and will move to Dallas when her foot has healed. It is not known at this time if Ribbon is small animal or cat tolerant. The infection in Ribbon's foot has finally cleared. The bandaging has been taken off, and she is very careful about using it. Her foster mom is performing daily physical therapy (it helps that Jo is an ER nurse) and improvement is being seen slowly. Ribbon's spay and dental were performed August 27, and she is still recuperating from that. It has been a hard, long recovery for Ribbon, but it looks as if she is headed to find her forever home soon!